This Downswept Douglas Pencil Slim tree features Feel Real® branch tip technology, creating a tree with remarkable realism. These crush-resistant branch tips are molded from real tree branches for an authentic living tree appearance. 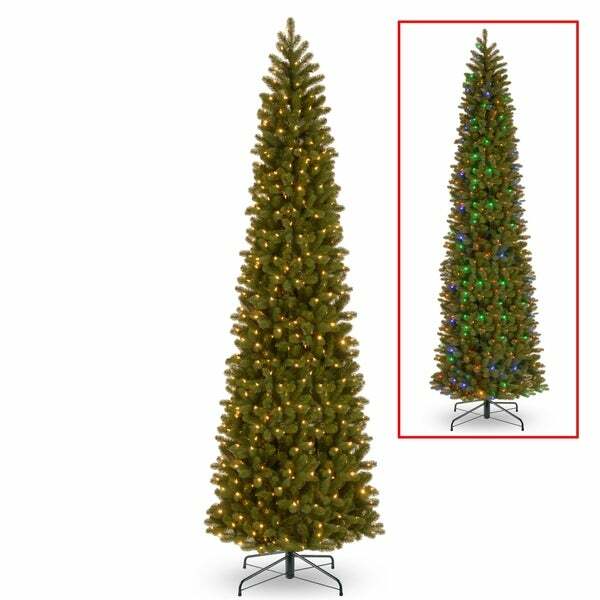 This tree is pre-strung with 850 Dual Color lights that change from warm white to multicolor with the touch of a button. The bulbs are low voltage LEDs that are energy-efficient and long lasting. Included is a foot pedal switch to control 9 different light colors and actions. This slim profile allows for display in corners or limited space areas. Hinged branch construction makes assembly quick and easy. Dimensions 44.0 In. X 44.0 In. X 144.0 In. Be careful on this tree. Was very disappointed once received and put up. Bottom 1/4 of tree brighter than the rest. Tried different hookups, but still the same. Way too much play in all sections that connect too. Tree not very stable at all and stood crooked. I don’t normally return items like this, but did this time. Pain to take back down and box up, but not worth it to keep a mediocre tree. Bought another 12’ in a different brand for similar price and much better. Straight and no lighting issues. Not sure if I happened to get a bad tree or just poor quality control. This is a nice tree. Needs fluffing to look it's best. Really like the lights - dual color and lots of functions, solid, fading, blinking in white and multi color. I haven't taken it out of the box yet but I will say that I am impressed that the box came so quickly and undamaged. I chose this one because the LED color change option and the slim profile will work nicely in our home. "Are these braches a combination of PVC and PE? PE are the molded ones. PVC are the older style “pipe cleaner” ones." "Does this require you to plug in a bunch of light sections or is it all built in to the post (connects just by connecting the post sections)?" This requires the lights plugged into each section of the tree. Only a tree with power pole connect has it in the post.